If listening to sad songs could heal your own sadness, then Amy Boone, Willy Vlautin and the rest of The Delines would put the counsellors of the world out of business. Because The Imperial is packed full of very sad songs. 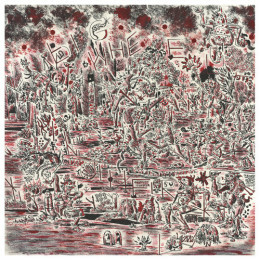 Another bunch of quirky songs from Cass McCombs. The artist who walks you right up to the threshold of a memorable melody only to reach over and ring the bell of the slightly grumpy neighbours next door. Frustrating at times, but features some really great bass lines. There’s a typically eclectic feel to the new Deerhunter album. On ‘Greenpoint Gothic’, for example, Gary Numan is surely in the house. For the most part, though, this is a fine bunch of exciting indie riffs for guitar and keyboards. Oh heaven. ‘Element’ is a particular highlight in the earworm department and it’s a great song to drive to. Don’t be fooled by the slightly shy-sounding vocals. There’s plenty of power to the songs on Meg Duffy’s second solo album. Most are about relationships of different types and, typically, there’s a sadness to the outcomes. There, though, the similarity with The Delines ends. Would The White Album have been better as a single album rather than a double? Just by virtue of asking the question, you know the answer. Of course it would. The same question could easily be asked of the new Cass McCombs album and the same answer would apply. Clocking in at 22 tracks and 85 minutes, the cutting room floor is surely as bare as the cupboard at Old Mother Hubbard’s. Three of the tracks – Seans I, II and III – are brief spoken-word snippets of dialogue from an old Haight-Ashbury documentary. Perhaps they’re an essential part of the meta-narrative, but if you’re on e-music and you’ve used up three of your hard-earned credits downloading them, then you’re probably more than a little ticked off already. ‘Satan Is My Toy’ is jarringly rocky. ‘Unearthed’ is old-style lo-fi. ‘It Means A Lot To Know You Care’ is a syncopated instrumental. ‘Everything Has to Be Just-So’ meanders for nine minutes. Duly filleted, there’s still more than enough to go around. For the most part, it’s classic Cass with some nice variation. Country guitar on a few of the tracks. Jazzy sax on a couple of others. The two stand-outs are ‘Joe Murder’, which gets into a really good groove and generates a great space in which to tell its drug-addled story, and ‘Brighter’, which poignantly features the late Karen Black on vocals. In the end, it’s not that Cass McCombs has lost all sense of quality control. It’s just that even when it’s good, there’s still too much to take in. In that regard, and that regard only, it’s just like The White Album.